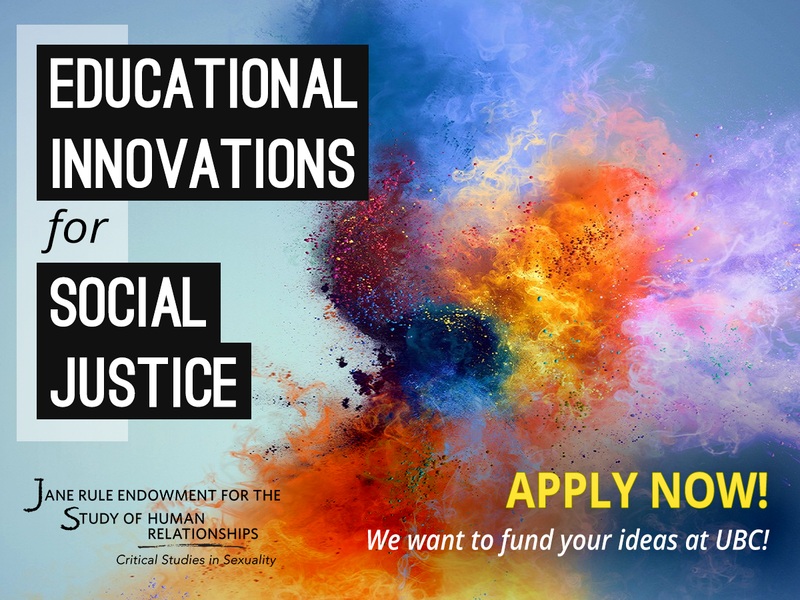 The Critical Studies in Sexuality (CSIS) Program (csis.arts.ubc.ca) Leadership Team is pleased to announce the Educational Innovations for Social Justice Initiative: Gender & Sexual Diversity and Transforming Learning Experiences Call for Proposals. The Educational Innovations for Social Justice Initiative is funded by the Jane Rule Endowment for the Study of Human Relationships. This CFP has a budget of $75,000 and is expected to fund five or six projects for a maximum $15,000 per project. Focus on undergraduate academic programs or post-baccalaureate or graduate professional programs (e.g., Counseling Psychology or Teacher Education or Engineering or Law or Doctor of Medicine or Midwifery). Please review the guidelines below before completing this form. What kind of proposals are accepted? Adjudication of the proposals will be conducted by a Critical Studies in Gender & Sexuality: Educational Innovations for Social Justice Initiative Adjudication Committee. The adjudication committee will consider proposals requesting funding up to $15,000. The term of the award is 12 months. Funds will be accessible through an account administered by the Institute for Gender, Race, Sexuality and Social Justice (GRSJ). 4) Relevance to current academic knowledge in intersectional social justice fields.